What is a Soft Structured Carrier? A structured, usually shaped body panel attached to a waistband with a buckle closure and shoulder straps which attach to the body panel above the leg holes. Straps use buckles and ladder locks. Front Carries: depends on brand; typically good for all ages. Some brands require an infant insert for newborns. Back Carries: depends on brand; for brands that allow it, good for babies who fit the carrier without inserts/modification and can sit independently. Forward Facing: Depends on brand; requires a carrier with either a narrow base or an ergonomic base that snaps in to a narrow setting. If so, good for babies with strong head and trunk control. The easiest style of carrier to learn to use. Very dad-friendly for fathers reluctant to learn wraps or slings. Usable by multiple sizes of wearers. Panel size is dependent on child's size. Therefore a parent who chooses to wear as their baby reaches toddlerhood or preschooler age may need to upgrade to a toddler-size or preschool-size carrier. Structured, tailored design means that some brands may fit the wearer better than other brands. Preferable to try carriers on in person before purchasing. Requires child to be fully sitting independently for extended periods of time before they can be used for a back carry. Narrow Based Carriers (NBCs) like <a href="http://wiki.babywearingdiy.com/do/edit/Main/BabyBjorn?topicparent=Main.CarrierTypes;nowysiwyg=0" rel="nofollow" title="BabyBjorn (this topic does not yet exist; you can create it)"> BabyBjorn </a>: has a narrower base that does not support baby's legs in an ergonomic "M" position. Not a safety risk for healthy babies, but may possibly exacerbate problems in babies predisposed to hip displasia. Unstructured, unpadded carriers like the Connecta or Sew Toot Voyager. Unpadded waist band is worn "apron style" (like a meh dai) and means that the carrier is less bulky and folds up smaller in a diaper bag. 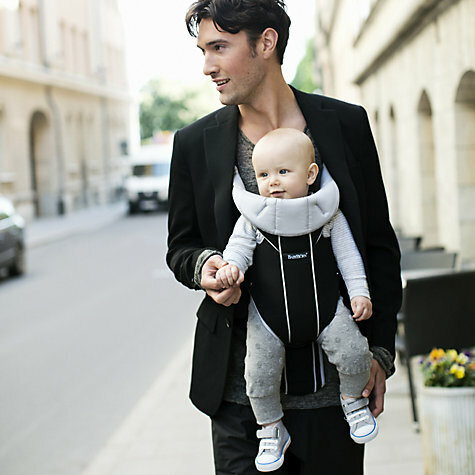 Hybrid carriers (Emeibaby, XOXO) combine aspects of a wrap with the ease of buckles. Body panel size is based on child's size. Body panel should be tall enough to reach at least up to baby's armpits but not so tall that baby's airway is obstructed. For new babies who still need neck support, panel should come up between the nape of their neck and the base of the ears. Some carriers recommend a brand-specific "infant insert" to provide core support for newborns, transitioning to the use of a "pillow" (or a rolled up receiving blanket) once the child fills out the body panel but is still a little too short for it. The width should be wide enough to support baby's legs from knee-pit to knee-pit (in an ergonomic carrier; narrow based carriers are not designed to do so) while still allowing the legs to swing freely at the knee. Babies whose legs are too short for the knees to swing freely off the sides of the panel should either be using an insert or (if the carrier allows) should be using the carrier snapped in to a narrow base setting. The straps on most soft structured carriers are one-size-fits-most, although some can be made with extra-length straps or can be sold with waist extenders. Be sure to use safe, weight-tested webbing and buckles! Buckles from camping stores are a great option. Also, before starting, I recommend reading our pages on choosing a safe fabric (for SSCs, an even heavier weight of 7oz+ is recommended - think heavy tote bag) and general construction safety tips. Why are there no DIY patterns for narrow based carriers? While narrow based carriers are perfectly safe to use so long as baby has no pre-existed hip conditions, they are typically so common (especially in second-hand stores) and inexpensive to buy commerically that there is not much of a demand for a pattern to make them. They also do not provide as much support for baby or wearer, so they tend to be less comfortable for older infants. If you are going to take the time to sew a carrier, we recommend it be one that you are going to get a lot of use out of! If you have a baby who only seems to settle when being held facing forward, the general recommendation is to try a hip carry or, if baby and wearer are ready, to try a back carry. Both of these options give baby a much better view than the traditional tummy-to-tummy positioning, while still giving more support and keeping baby much more in line with the wearer's center of gravity than forward facing allows for. Also keep in mind that, though there are exceptions, baby's interest in forward facing is often a fairly temporary phase, so constructing a carrier for the sole purpose of getting through a month or two of trying to turn around may not be worth your time. If you are determined to find a DIY way to forward face your child, you may be interested in knowing that a meh dai can be cinched (the same way you would to wear it with a newborn) to use for a forward facing carry, and there are forward facing carries for both woven wraps and ring slings as well. Copyright © 2008-2019 by the contributing authors. All material on this collaboration platform is the property of the contributing authors.